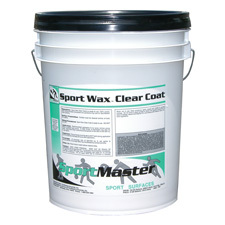 Sport Wax Clear Coat is a ready to use, 100% acrylic, clear drying emulsion formulated as a protective top coat for SportMaster Color systems. A coverage rate of 200-300 sq. ft. per gallon is recommended. Coverage rates may be affected by surface porosity. 100% acrylic, clear drying emulsion formulated as a protective top coat. Surface must be cleaned entirely of dust, dirt, debris. Sport Wax Clear Coat is ready to use. DO NOT DILUTE. Recommended application is by spray (airless power spray or garden type pump). A roller, brush, or squeegee may also be used. Sport Wax Clear Coat should be applied at the rate of 200-300 sq. ft. per gallon.. Sport Wax will be dry to the touch in one hour at 72°F.